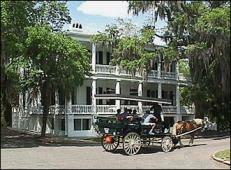 Beaufort County, SC is a family oriented area that is rich in history and beauty. The county houses three military bases, many historical sites, and just about every amenity you can think of! Whether you are looking for your first home, a waterfront property, golf course living, or a quiet place to retire and relax, Beaufort County has something to offer! Although there are some exclusive properties throughout Beaufort County, our average home prices start in the mid $100′s and range into the million’s. This allows for most anyone to find a home of their dreams. Please browse through this section to find out more about our featured Beaufort County communities.